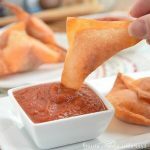 Everyone will love these crunchy wontons filled with pizza sauce, cheese, and pepperonis! Pizza toppings of your choice make sure they are cut small! Lay wonton wrapper flat and place a small scoop of pizza sauce in the center of the wrapper. Then add cheese and toppings. Lightly brush outside edges of wonton with water and fold it over to make a triangle. Press gently on the edges to make sure they are sealed. Gently drop wontons into the hot oil and cook for 1-2 minutes or until golden brown. Remove from oil and place on a plate with a paper towel to drain the grease from them. Serve with a little extra pizza sauce!